Now I have written many web pages for others and in furthering my many and various interests -- but before this year I had never even tried to writte my very own personal website. Not just to list my personal likes and dislikes, my pet ideas, but to make a statement as to who and what I am. But how to start ? I'll write the end bit first -- a set of quick links to some of these many web pages. Why do I write Web Pages ? Leaving aside the issue that I write webpages to further causes that I support, I find that consructing websites is a form of therapy; sometimes I wonder how all those do not write code, design set-ups or manipulate images can manage to escape the madness, the melancholia, the panic fear which is inherent in the human condition. Robot in the Smithsonian. What made this man ? The only woman ionospheric physicist and the only Australian involved in the design of US Air Force SatNav system later renamed GPS. researcher in the MIT Artificial Intelligence Laboratory. 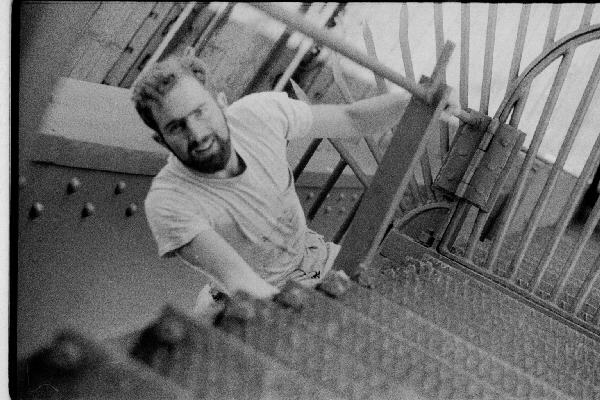 Sydney Harbour Bridge night Climbing the Sydney Harbour Bridge by the arch from hinge point to hinge point -- -- without being caught by the Police -- was one of the "must-dos" of my most conservative youth. My daring extended to one memorial daylight trip that is recorded for posterity here. Just click on the pix of me bypassing the access barrier, or here. CONTROVERSY As a member of the LOGO Group at the MIT Artificial Intelligence Laboratory in the 1970's I have the greatest of respect and affection for Marvin Minsky, and Seymour Papert. Shortly before I arrived at MIT in 1974, Marvin Minsky's classic paper, "A Framework for Representing Knowledge" became freely available - and was the basis for organising my own MIT AI Lab Memo 338 The Art of Snaring Dragons. 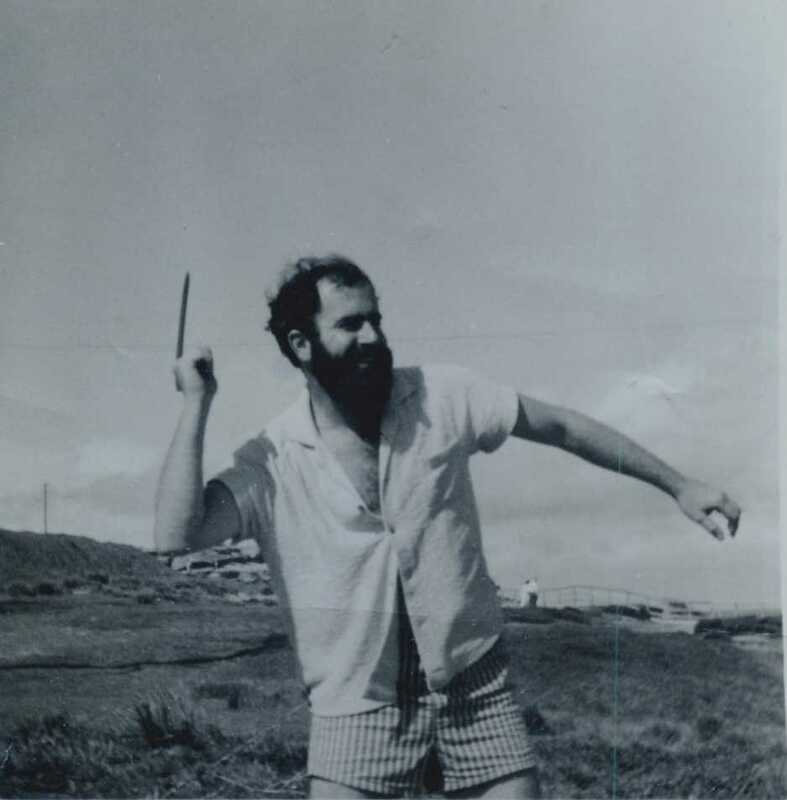 Seymour Papert - who had actually been a member of Piaget's group, introduced me to the gamut of research on epistemology by Piaget and his co-workers. There is no doubt that Minsky and Papert's book Perceptrons was a block to the funding of research in neural networks for more than ten years. The book was widely interpreted as showing that neural networks are basically limited and fatally flawed. The controvery is to whether Minsky and Papert shared and/or promoted this belief. In Percepron Controversy I show conclusively that they did in fact promote this understanding of their book. Could a two-year old acquire an Erdös Number of 4 ? What is Matt Damon's Erdös Number ? Does Joan Baez really have an Erd�s Number of 3? Paul Erdös was an amazingly prolific mathematician, who wrote research papers in mathematics jointly with 507 collaborators. These immediate collaborators themselves collaborated in joint papers with others, and so on . . . Almost all professional mathematicians are connected by a chain of co-authors of mathematics research papers with Erdös. In fact in over 80 percent of cases this chain contains less than five links. A joint author with Erdös has an Erdös Number of 1, those of their coauthors who did not themselves write joint papers with Erdös have Erdös Numbers of 2. And in general a mathematician has an Erdös Number that is just one more than the minimum Erdös Number of his collaborators. My personal Erdös Number is 5, -- there are in fact 5 different chains of published papers that link me to Paul Erdös which yield this value of five. But mathematicians - - including Paul Erdös himself - - produce joint 'publications' other than research papers in mathematics. So we take the same concept of Erdös Number very seriously, but extend the concept of 'publications'. Our Basic Rule for Assigning Erdös Numbers is: Was enough Chutzpah involved in the claim for it to be taken seriously ??? with chutzpah as defined here. Dragons Dragons are captivating problems in qualitative physics, which require at most high school mathematics for their solution , and mostly no maths. YoYo -- to left -- is an example dragon. Note conflicting heuristics. Upper case = YOYO for a steady pull to the right- which direction does the YoYo go? YoYo rotates clockwise ?? Lower case = yoyo for a steady pull to the right- which direction does the YoYo go? In direction of pull? The paper I wrote at MIT in 1974, Artificial Intelligence Lab memo 338 (1974) elucidates the Art of Snaring Dragons, and relates dragons in qualitative physics to the conservation puzzles such as the egg cup puzzle, and other qualitative puzzles Piaget used to explore the thinking of children. Inducia Capillaria Geckos are the most intriguing of Dragons. Colourful but bereft of eyelids, lacking claws, yet so provocative. Aristotle wondered at the behavour: how the gecko climbs walls and even across ceilings -- was beyond HIS physics. 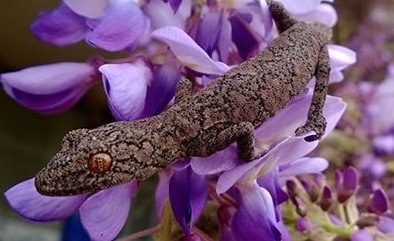 When a would-be physicist is challenged by a gecko many try to bar this creature -- gecko-barring -- but the more creative task is to tame the gecko -- gecko adjustment -- to include WITHIN the physics analysis - not outside. The genus was properly first described in mathematics by Imre Lakatos, hence the alternate nomenclature Lakatosian Monster. Inducia Capillaria [to left and right] is a gecko that looks again at the problem of water (or mercury) rising (falling) up (down) a capillary tube. 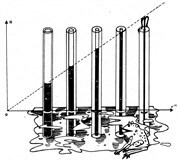 In most elementary physics courses the student is shown a computation of H, the rise/fall of the liquid column above/below the surrounding fluid, as H = K/r where r is the capillary radius, and K involves the surface tension and the angle of contact. 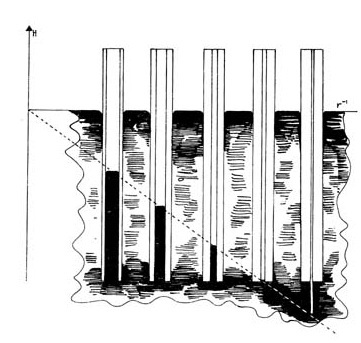 One can simply reject the two images here as "unphysical" or simply "impossible" -- but the real challenge is to extend the analysis to work out just what happens for tubes of "insufficient" length. 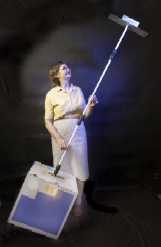 My late wife Elizabeth Essex-Cohen, photographed in 2002 with a 1:1 model of the FedSat satellite, for which she was in charge of GPS-related experiments. The first Australian scientific satellite, WRESAT, was launched from the (Australian) Weapons Research Station at Woomera, South Australia, in 1967. 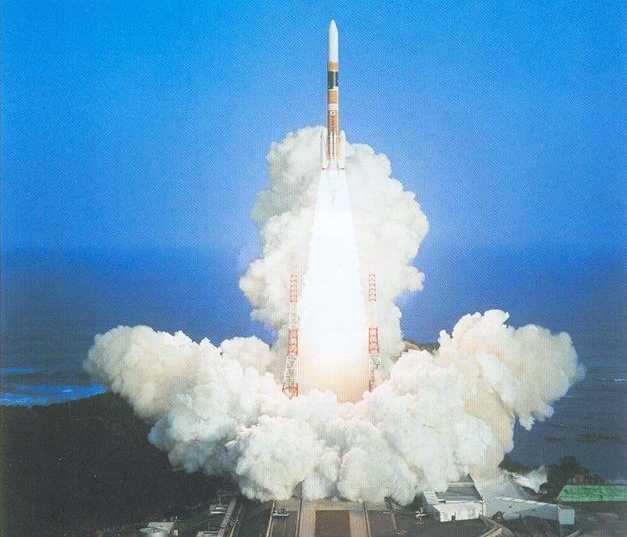 The second Australian scientific satellite, the micro-satellite FedSat, was launched December 14, 2002. The FedSat researcher in charge of GPS-based experiments was my late wife Dr Elizabeth Essex-Cohen, who in 1974, working at the (US) Air Force Geophysical Research Laboratory near Boston, had evaluated the impact of the ionospheric plasma on radio signals from satellites powering the proposed satellite navigation system, then called NAVSTAR, later renamed GPS. 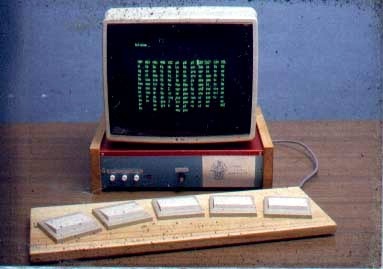 Essex-Cohen had in 1969 pioneered the first use, in Australia, of so-called beacon satellites to probe the ionosphere. 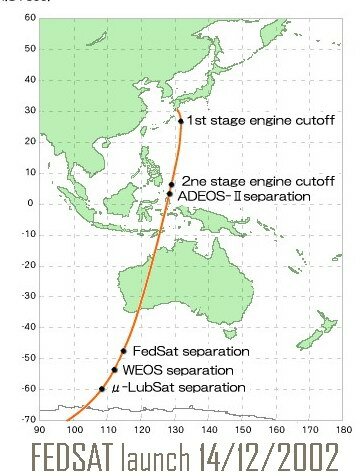 FEDSAT - the FEDeration Satellite lauched in 2002 in lieu of 2001. Dr Elizabeth Essex-Cohen, first Australian satellite beacon experimenter 1969. Dr Elizabeth Essex-Cohen, role in the design of the NAVSTAR-GPS satellite system in 1974. She was as an ionospheric physicist utilising NAVSTAR/GPS from 1978. For FedSat she was in charge of GPS-related experiments on FedSat. This had great possibilities for exploring the region of the ionosphere ANOVE FedSat's LEO orbit. During 1974, Elizabeth worked at the Air Force Geophysical Research Laboratory, just outside Boston, computing the curved trajectories of radio waves from low earth orbiting satellites, these radio rays being curved due to ionospheric plasma. This work was basic to the determination of orbit parameters for the GPS satellite constellation. At the same time, the writer was in a part of the MIT Artificial Intelligence Laboratory, in a building in Tech square. On the floor below was the CIA, on the floor below was IBM; Elizabeth and I were in the heart of the US Military, academic and industrial complex in Boston. The (historic) web page of the GPS Signal Science Centre, at Space Physics Department, La Trobe University, Melbourne, Australia has been reproduced here. Inherently this historic (~1997) web-page has several broken links which at this late date cannot be repaired. Elizabeth Essex-Cohen, the fourth Australian woman to obtain a PhD in Physics in Australia, was born in Grafton, NSW in 1940. 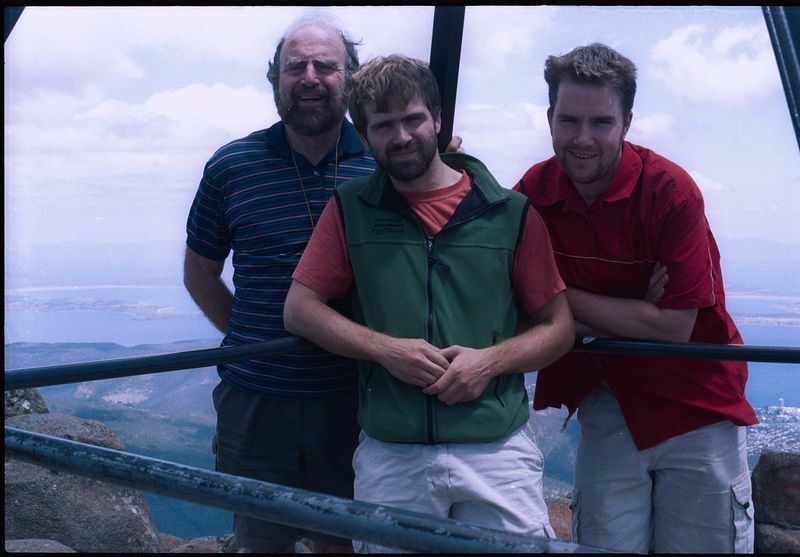 Its a striking coincidence that the first female radio atronomer Ruby Payne-Scott MSc was also born in Grafton, and that both can be described as radiophysicists. Skiing Mt Baw Baw 26 December, 2006, with Alex. During 2006 I spent July - August in California, leaving daughter Zoey to feed my two cats, Heisenberg and Schrodinger. As a reformed orthodox, and lapsed Kabbalist, I have no special standing in the Land of Oz as a Cohen. But I learnt from TV's "The OC" that in Orange County the Seth Cohens rule supreme. But maybe both The OC and Dan Brown lie? As I got fit for tramping the Sierras by daily bushwalks along the Yarra, I spied an albino kangaroo -Silas - lurking in the trees, shadowing me. At midnight Friday, lying with my limbs contorted in the rough shape of a driedel, the realisation came that the mysterious Shabbat Dei was after me. 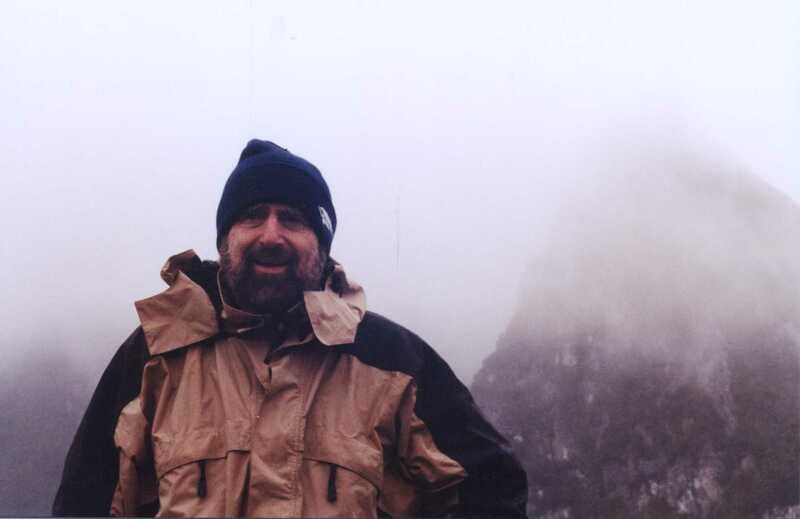 Yet I survived California, climbed Half Dome high above Yosemite with my son RayZ, bicycled across the Golden Gate with Vic, to return refreshed to Australia. 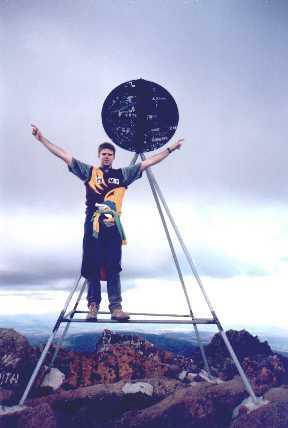 I love this years summer -- spent Boxing Day 2006 skiing on Mt Baw Baw (120 east of Melbourne) with Alex and his redhead. It wasn't til afterwards that I learnt that the Redhead had been educated at Hogwarts - which must be the explanation for this magical day. 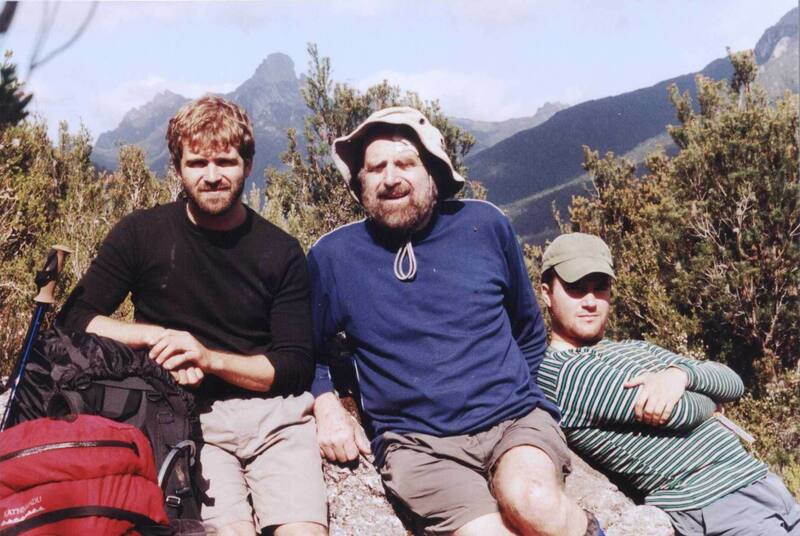 <?A> On December 28, 2003, with sons Raymond and Alexander (plus Megan) we set forth on the ultimate Australian bushwalking challenge - to reach the top of Federation Peak, in the most inaccessible portion of South-West Tasmania. 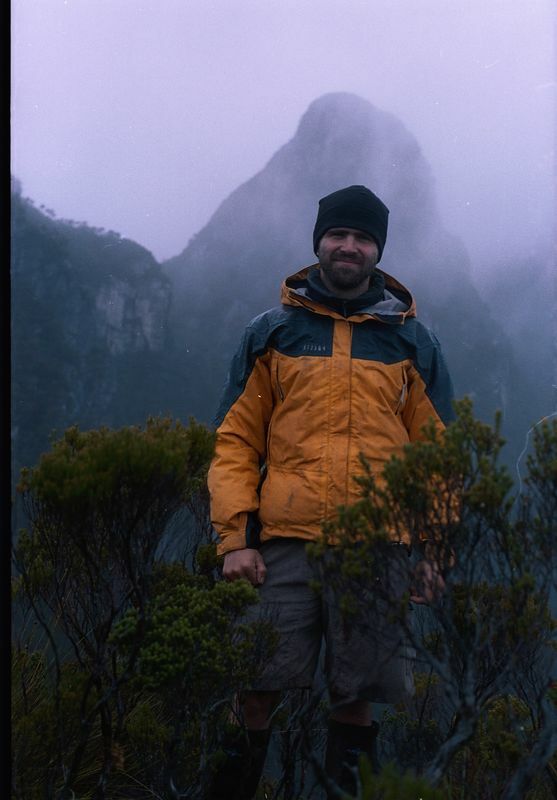 We trudged across button grass plains, and climbed up the almost vertical Moss Ridge tree by tree to Berchevaise Plateau using the route pioneered by the Antarctic explorer Berchevaise in 1949. This was more than a bushwalking trip, so Harvey carried the 50m rope and each of us had a climbing harness for the high exposure climb up the final 20m to the top. The ascent of Moss Ridge fully equipped involves much pack hauling using ropes,so from Cutting Camp we set out very early with only day packs hopefully to make a one day return trip to the summit, or at least to return to a tolerable bivouac location well below the summit. Here is our trip report. Other pics from this trip are on Smugmug at http://shogun.smugmug.com/gallery/644041/1/27518366 (Opens in new window). 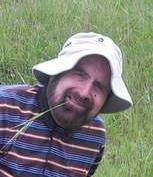 Years ago, I made an attack on Federation Peak from the other side, coming up Luckman's Lead and circling around to Goon Moor, where we camped for five whole days waiting for a break in the weather. From Goon Moor I took this pix of the flank of Federation down to Lake Jeeves, with "The Sundial" straight ahead. Click on thumbnails on left to view full-size. The Kowmung River very close to the Colong Caves. 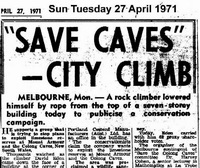 Saving the Colong Caves Saving the Colong Caves In 1971 with fellow caver Nicolas White organised the Melbourne campaign to save Mt Armour and the adjoining Colong Caves, which were in the very heart of a proposed Kanangra-Boyd National Park. 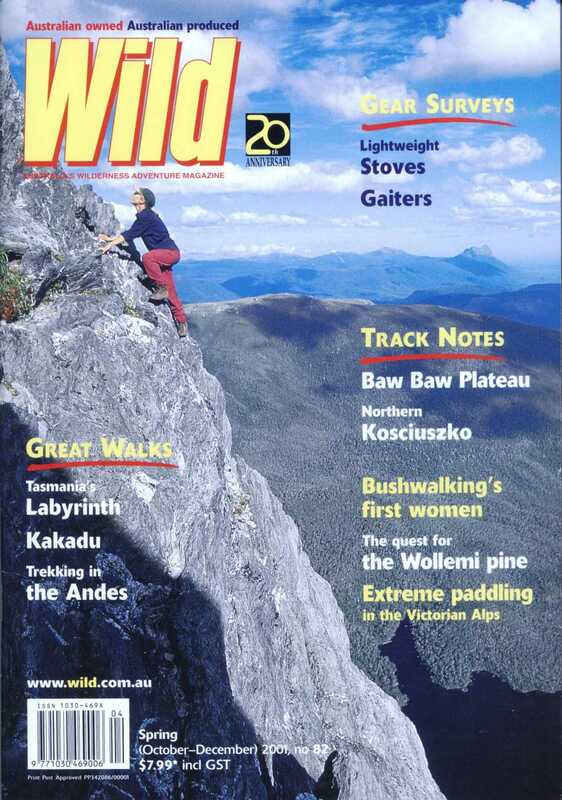 The story is quite amazing - one aspect to be highlighted is that to generate publicity I staged the first Conservation Absail in Australia. The mining company APCMA, which hoped to quary Mt Armour to produce cement, had relocated its AGM to Melbourne to avoid publicity, but as a result of this campaign the AGM became TV and headline news. The first educational robotics project for primary and junior High School students. Based on the earliest PCs - pre-Apple and pre-PC The Oznaki Project 1975-84 In December 1975 I was invited to attend a NSF-funded "Loud Thinking Workshop" at MIT, and enroute I visited the worlds second computer store at Palo Alto. 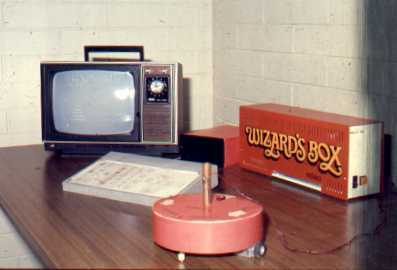 On my return I successfully sought funding OZNAKI - Polish for Symbol -was an educational robotics project that I ran from 1975-84. With research student the first Turtle robot outside the US was constructed. The first micoprocessor was only four years old, so software support was non-existent, requiring signal work in developing software development tools. Around Harvey's Head Around Harvey's Head This rolling panorama takes you on a complete circuit of Harvey's Head. www.ajhs.info AJHS The official home page for the Australian Jewish Historical Society, the AJHS. The AJHS, founded in Sydney in 1938, has published its Journal since 1939. Fom 1995 I had urged the AJHS Vic to establish a website but this idea was rejected both on the grounds of cost, and relevance to the ageing membership. Finally, at my personal initiative and expense, I established this website in 2004. A succint directory of recent journal issues and special publications is given, including contents. Online here is a complete cumulative index -- by subject and category - to the AJHS Journal - from 1939 to now. Details of the archives of both the AJHS (Vic) and AJHS [NSW] are given. 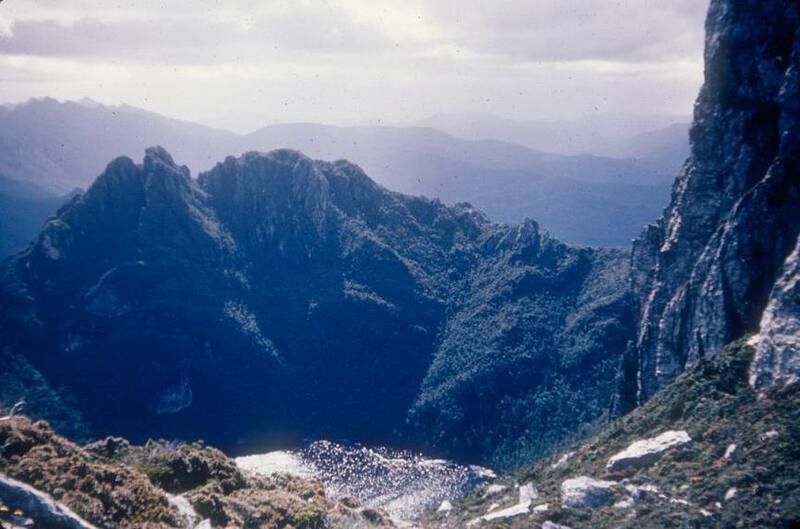 This site includes the website of AJHS (Vic). jewishhistoryaustralia.net Jewish History Australia A tour of Australian Jewish History. A timeline of Australian Jewish History from 1788. This site documents the Jewish experience in Australia, which began with the arrival of the First Fleet in 1778, and continued with Jewish involvement in all facets of the subsequent development and evolution of Australia. The involvement of Australia with the re-establishment of the state of Israel is detailed, along with vignettes of certain Pacific and Asian Jewish communities. The Site provides information, sources, photos, links useful for family history and genealogy. Historic sites, portraits. Stories and folklore. Australian Jewish 'firsts'. Links to other resources. Included is an account of the underground school in the Kovno Ghetto during the Nazi occupation, and amazing links of that act of defiance of the Nazis to Australia. Wallaga Lake At about the time of the NSW "Freedom Bus"- the Australian National University Jewish Students Union - established a children's club at the Wallaga Lake Aboriginal Reserve, on the far south coast of NSW. The Club - the Nulla Nullas - run during 1964-66 - had undoubted success, but ended as key ANUJSS members left Canberra in early 1966. It is noteable that the Nulla Nullas gave charity in (in the form of gifts) to white children (in hospital). Others both within and outside the Koori community have since contributed to the revitalization and empowerment of the Koori village at Wallaga Lake, but traces of ANUJSS's interaction are there still. A few pix of a stretch of the Yarra River near my home. and the local albino kangaroo, Silas. Click to view the Google satellite view that covers my stretch of the Yarra from the end of Laughing Waters Road, past the mysterious Red Billabong to opposite the Pound Bend Tunnel. www.poavic.org POAVIC This is the homepage I created for the Property Owners Association of Victoria. The POAVic is a non-profit group concerned to represent and serve the interests of small-scale owners of both residential and commercial land in Victoria. Australia is unique in the world in having in several states a set of taxes "progressively" based on the aggregated values of the owners total holdings. Historically, Land Tax was only applied to very large holdings, but steady inflation has brought the most modest holding within the gamut of this bizarre tax - from which personal homes and all primary production land are exempt. The Land Tax regime is especially severe in the state of Victoria, where the POA-Vic has gathered anecdotal evidence that it is having a major effect in reducing the level of private ownership of low-cost residential properties. Moreover, large scale developers who must strive to minimise the impact of Land Tax are driven to the overdevelopment of suburban land, to produce oversized apartment towers. New Zealand Jewish Archives This is the website I created in 2006 for the New Zealand Jewish Archives, which are located at the national capital of Wellington. From the earliest days of European contact with New Zealand, Jews were involved in all facets of New Zealand history. In fact the Dutch "discoverer" of NZ in 1642, Abel Janszoon Tasman, had as quartermaster a sailor by the name of Cornelius Joppe, most probably a Jew. As a percentage of the population Jews have always numbered less than 0.2 % -- yet -- in a number of ways have made a difference to the development and history of New Zealand. A Melbourne Rabbi, Morris Goldman, wrote the first history of the Jews in New Zealand,and over the past sixty years the Australian Jewish Historical Society has published papers on aspects of this history. In 1993, to commemorate the 150th anniversary of the first service held in NZ, a substantial history with a Wellington focus, A Standard for the People was published. The New Zealand Jewish Archives, established in 1980, but increasingly active more recently, has been accumulating the basic resources for historical and genealogical research: such as communal registers and minute books, as well as portraits and other items of cultural significance. Hawks on Top My family has had a long involvement with the Hawthorn Football Club. Perhaps most strking, on Sunday September 24th 1983, Elizabeth I and the boyZ were at a hotel on the rim of the the Grand Canyon, Arizona. The 3 boyZ - aged 8, 6 and 3 - wearing Hawthorn tops found themselves being congratulated all round on Hawthorn's comprehensive victory against Essendon in the Grand Final win of the previous day. Of course Hawthorn was in the next six Grand Finals. www.kutzpah.net I've never inhaled, nor do I play the sax. But I do admit to gross kutzpah. In his classic book Chutzpah Alan Dershowitz defines kutzpah, however spelt, as "boldness, assertivenes, a willingness to demand what is due, to challenge authority, to raise eyebrows"
Another Harvard alumnus, my nephew Rodney Marks, who recently served a year as 'professor at large' at the University of NSW, has written the most comprehensive dictionary of management terms called the contradictionary, as a guide to the kutzpah of management. What more can I write? This is my very personal take on kutzpah for those -- like me -- who never managed the guttural k sound in Chutzpah . Once I could throw a boomerang to return, sometimes even into my hands. I was quite evangelical, and at one ANZAAS Conference I lead a session teaching and practicing this art. But in, in the USA, after meeting one of my many American second cousins. I took my cousin's son Jonathan and a friend of his to the local park in Swampscott, Mass. I demonstrated and offered clues, then the friend threw the boomerang with much vigour directly striking Jonathon hard quite near his eye. Trauma with no lasting effects - but I've never been forgiven. So I no longer teach.